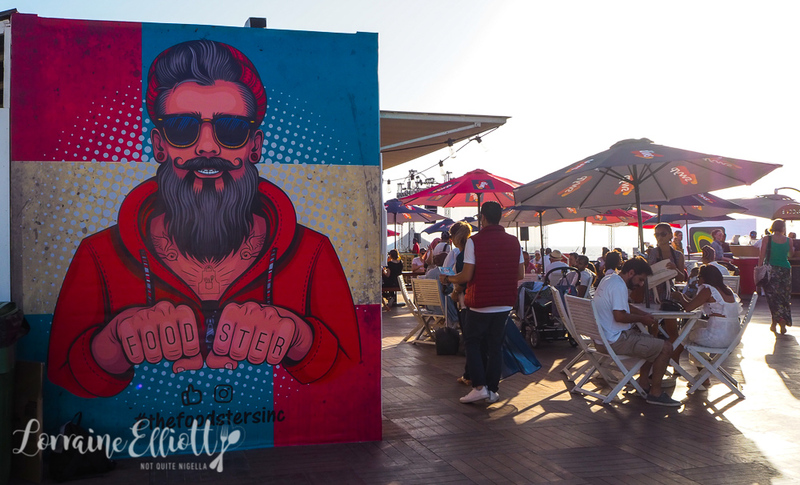 Dubai is a diverse country with over 200 different nationalities and if you want to sample some of these, make sure to head to Dubai during the Dubai Food Festival for culinary trip around the world. Dubai is part of the UAE, a federation of 7 emirates that united to become the UAE in 1971. It includes the capital Abu Dhabi, Ajman, Dubai, Fujairah, Ras Al-Khaimah, Sharjah and Umm al-Qaiwain. Winter in Dubai is peak season with temperatures in the mid 20's (as opposed to 45C and above during summer). 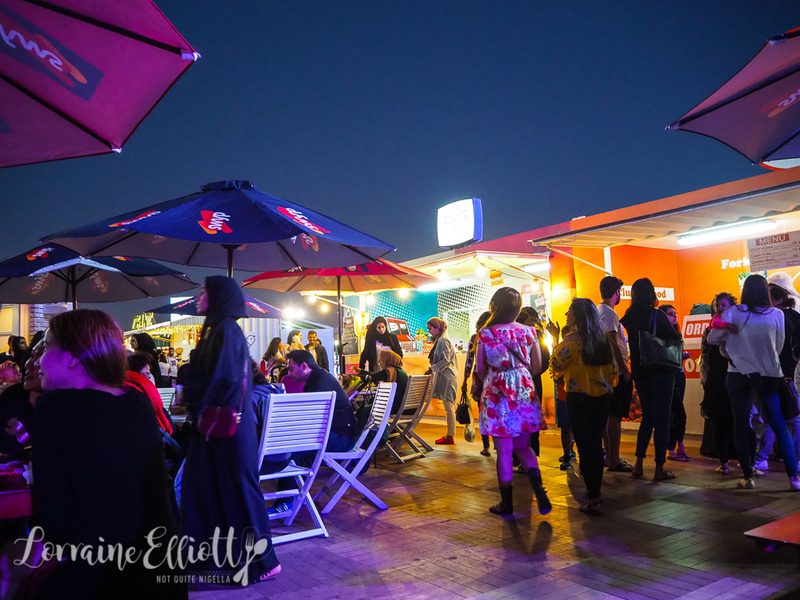 And every year in March it plays host to its very own Dubai Food Festival! 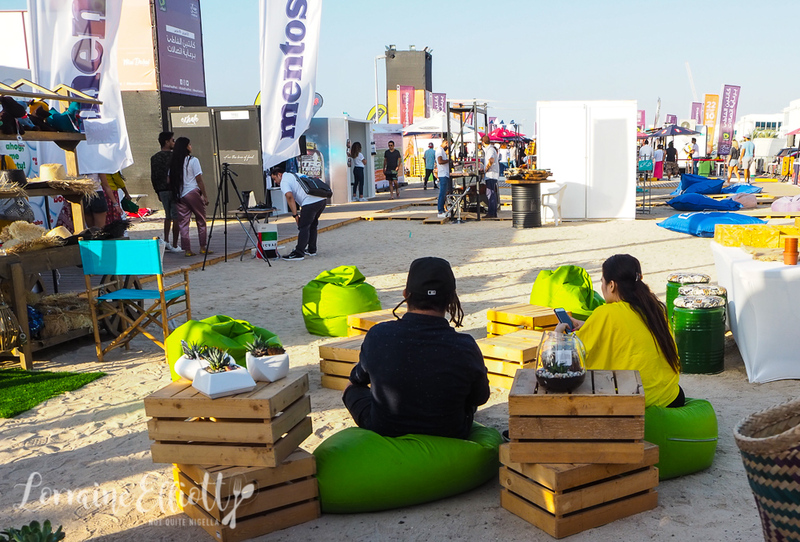 The Dubai Food Festival is held at Jumeirah Beach behind Sunset Mall to take a walk around the Beach Canteen. There's a mix of people, some in traditional abaya (for women) and thawb (for men) and the mix is international with many enjoying the cool beachside breeze and the blood red moon rising in the distance. 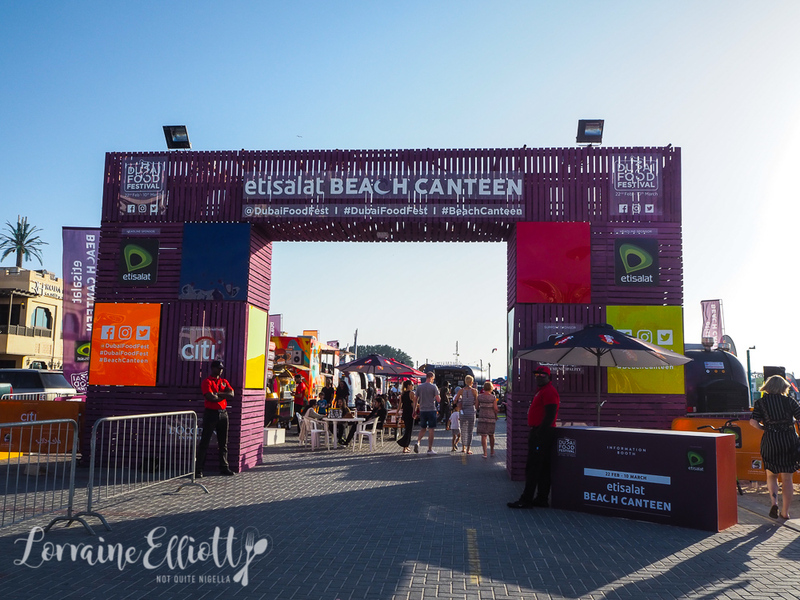 The Beach Canteen stands are located in two adjacent clusters and there is a lot of variety. Want tacos, baos or brisket? How about fried chicken in a waffle cone? We first do a quick survey of the space deciding on what we want to come back to order. It's not easy to choose and we've only got so much stomach space (we are headed to dinner shortly afterwards). But first there's a commotion in front of the Maiz taco truck. At 5pm every day they have the "Paqui one chip challenge". We watch as people open up a red coffin shaped box and unwrap a red foil packet containing a single corn chip. What is special about this chip is that it is dusted in the Carolina Reaper chilli dust. People take a deep breath, crunch on it and swallow before reaching desperately for a bottle of milk. We have no choice but to buy one ourselves (although I'm not game to try it while I am here because we are yet to sample so much food). At 50 dirhams it isn't cheap but it is hard to find these chips. 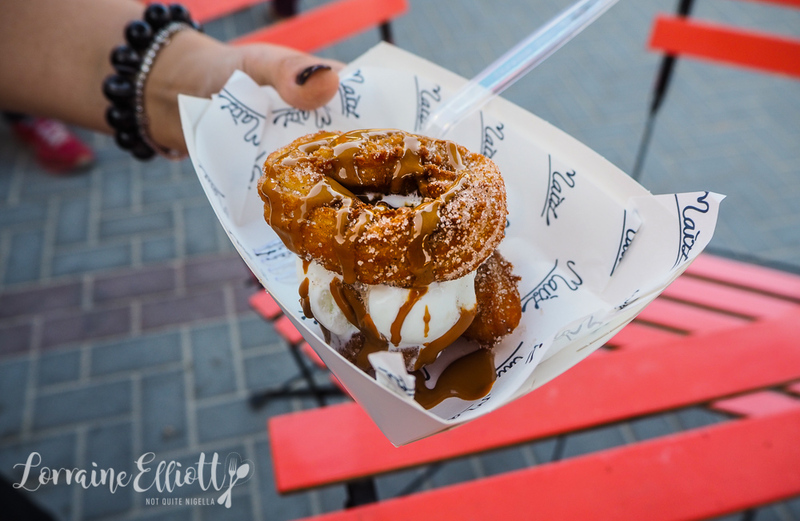 We do try the Maiz churros ice cream sandwich drizzled with lotus caramel and ice cream. The churro top is crunchy even with the ice cream and sauce and it's fantastic. Next door is the Zapiekanka truck. So what is a zapiekanka? 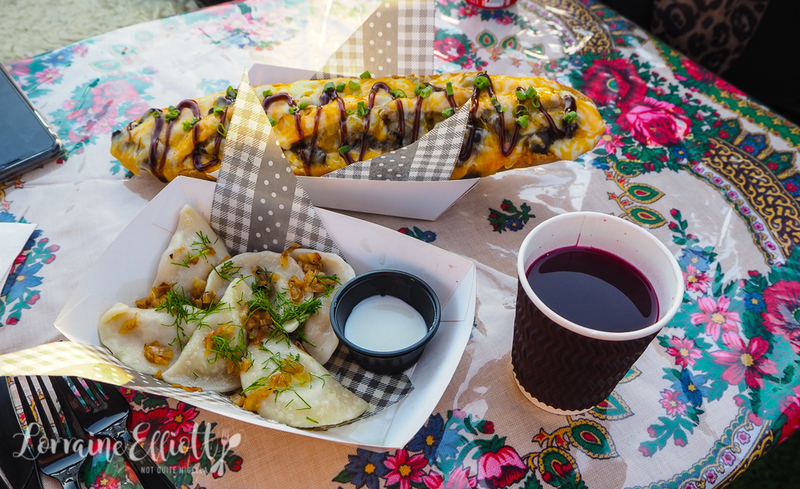 It's a traditional Polish street food, a halved baguette topped with a range of items from a tomato based marinara to bechamel or smokey one. They're very friendly here and we order some pierogi dumplings as well as the smoky Zapiekanka. We also try some of their borscht. Zapiekanka's owner Olimpia is super friendly and explains that their borscht contains probiotics for added health benefits. It's delicious and flavoursome. I've only really had Russian borscht which is mildly sweet and creamy and cold. This is a bold soup served warm with an abundance of flavour. The pierogi are comfortingly good and served with sour cream. 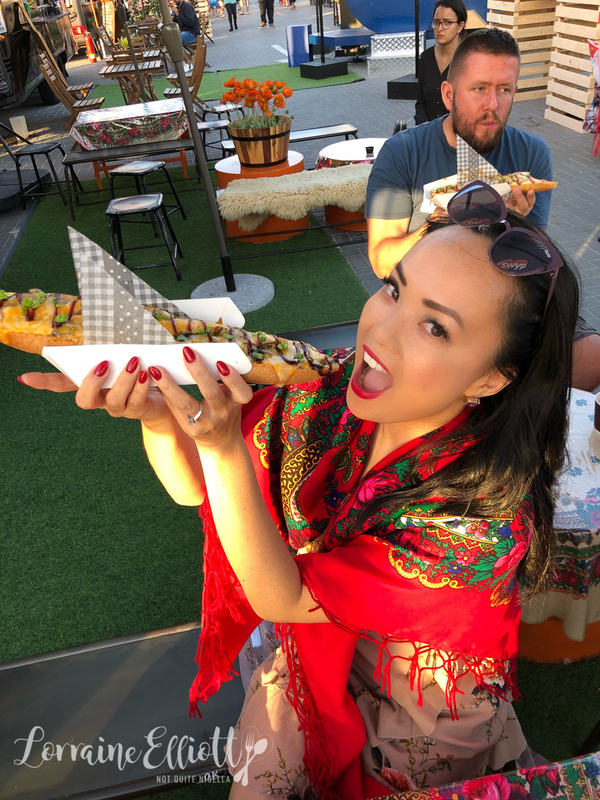 Olimpia loans me a traditional scarf for a photo and after the obligatory classic shot holding a zapiekanka (head back, mouth open, zapiekanka ready to be eaten) we sink our teeth into the crunchy sub. On top is bechamel, sauteed mushrooms, cheese, house smoked chicken and spring onions and it's pretty damn fabulous. 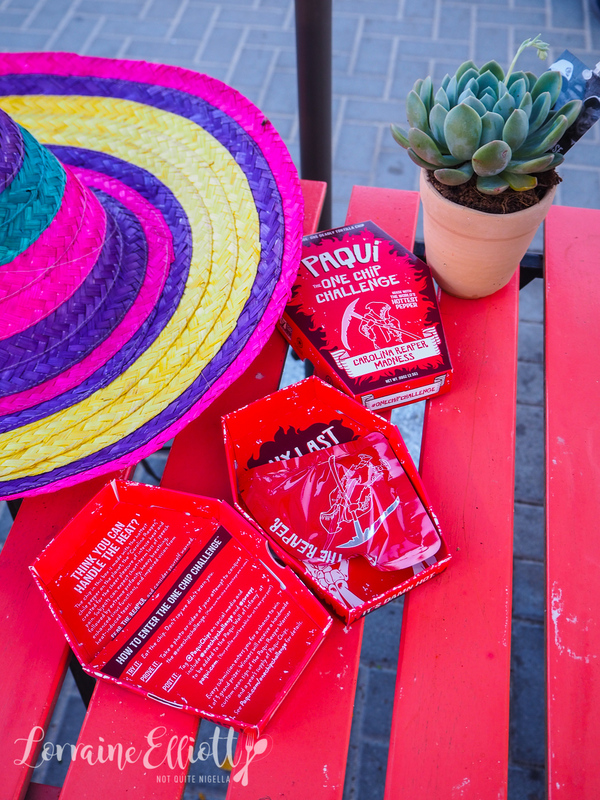 We find it hard to stop at three bites no matter how hard we try. Olimpia asks if we can stay for a slice of her apple pie. Sure! 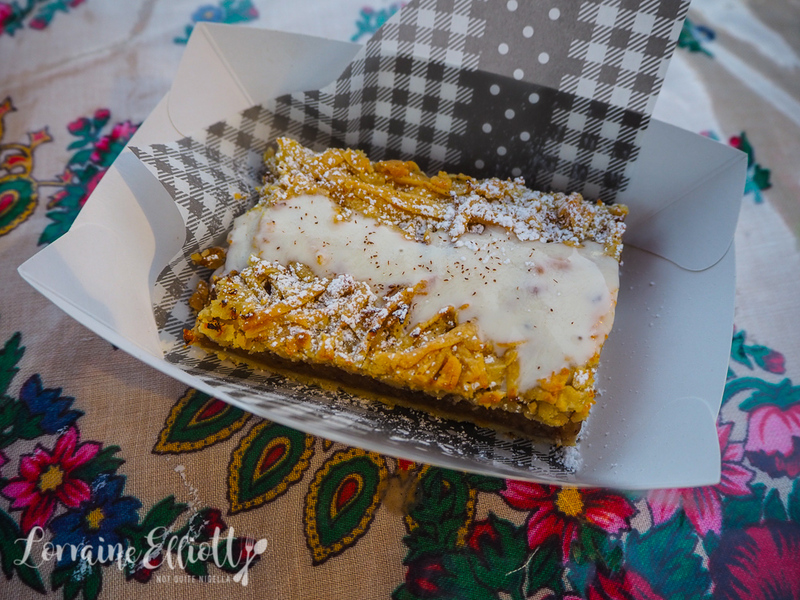 It's a rectangular slice, not too sweet and served with vanilla cream sauce. We all have tokens so someone else buys from fried chicken baos from Take a Bao. 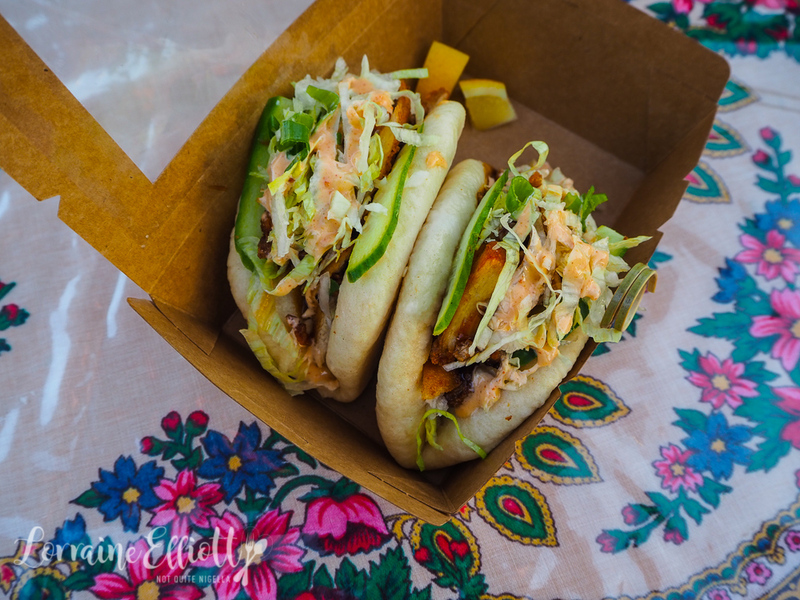 With a soft, downy bao and crispy, crunchy fried chicken, a piquant, creamy mayonnaise and shredded lettuce they're bigger than most baos and generously filled. 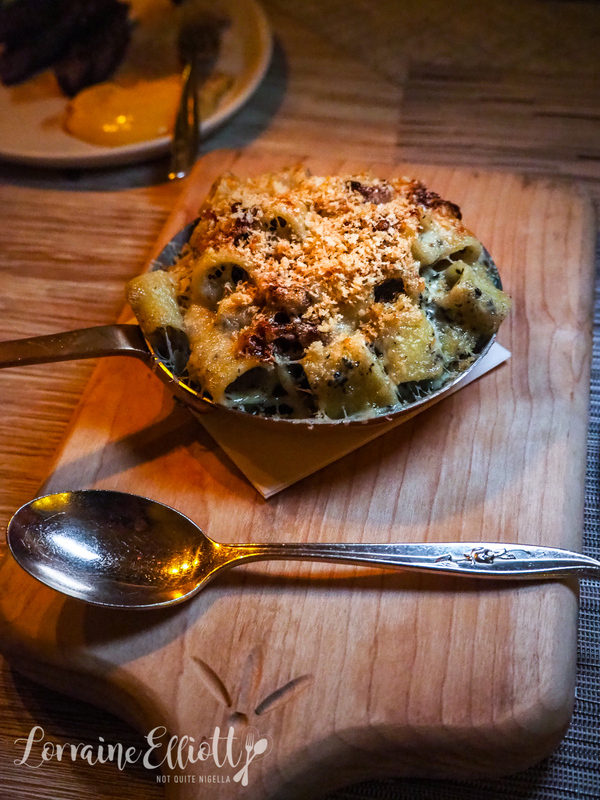 This just makes us hungry to try more. We cross the path to the other cluster of food trucks. 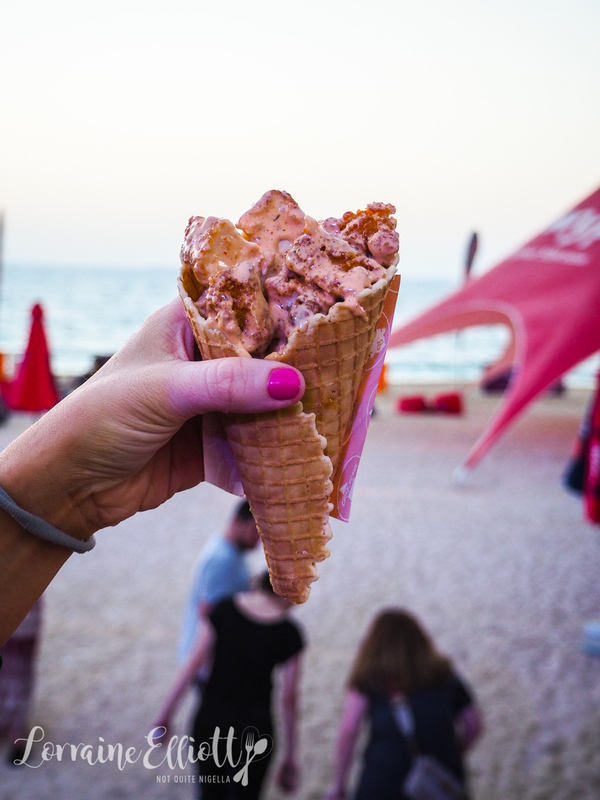 There is so much choice that tempts us from a distance and we stop at the New York based Chick N Cone debuting at the festival. It is, as the name suggests, fried chicken in a waffle cone stand where they are busy pressing fresh waffles and shaping them into a cone. When we dither about the choice of sauce they offer to give us samples of both with the chicken. We try the chicken with both the ranch and bbq sauces and it's delicious-crunchy and saucy at the same time. 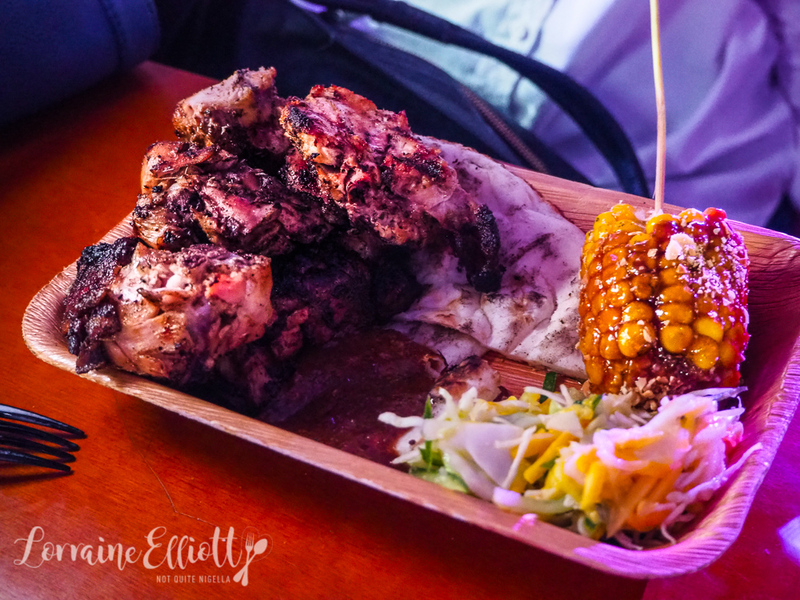 This only whets our appetite further for the Jamaican jerk chicken which is smoky and gorgeous with a fantastic jerk seasoning on top. The corn cob is curious-covered in a sticky caramel, it leaves me confused. While I loved the chicken I wasn't a huge fan of the corn. Then it's time for sweets. 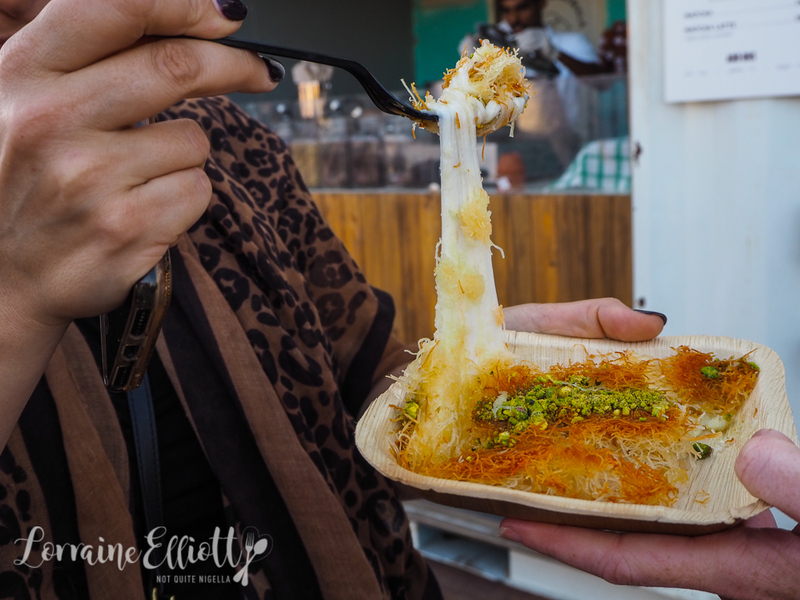 The knafeh is a stretchy cheesy number that they cut off from a huge knafeh pan drawing enormous foot long strings of cheese. Another popular stand is the Inventing Room. Everyone exiting with their goodies emerges from a cloud of dry ice. 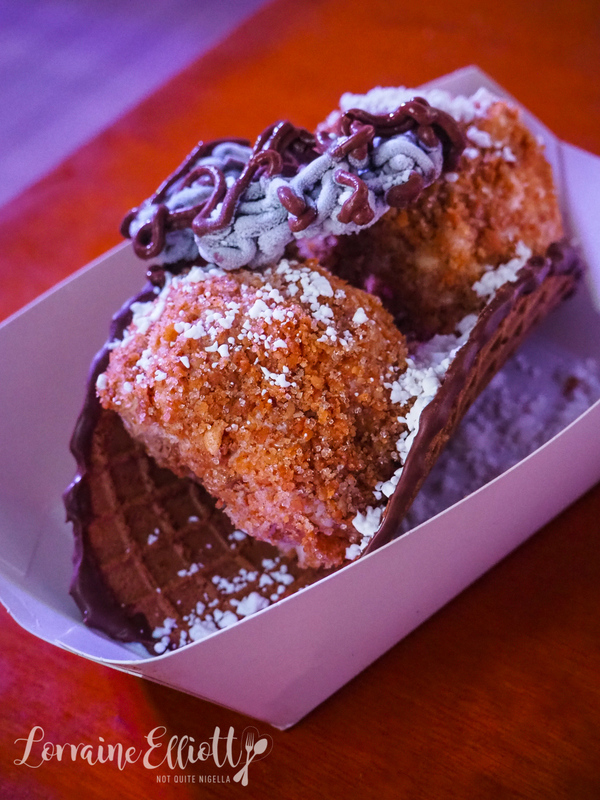 There is a crisp waffle "taco" filled with nitrogen ice cream sprinkled in cookie crumbs like a deep fried ice cream. On top are squiggles of frozen Nutella. Heaven. We are sharing a table with another couple and notice their Dough donuts. "Please have one," they say offering us their boxes of donuts. We can't resist their kind offer and the pistachio icing donut is wonderful-it's so light in texture and freshly fried that despite the fact that we are off to dinner I can't help but take another bite. We look at the time and it's time to bid the Beach Canteen goodbye. Dinner is back in downtown Dubai. 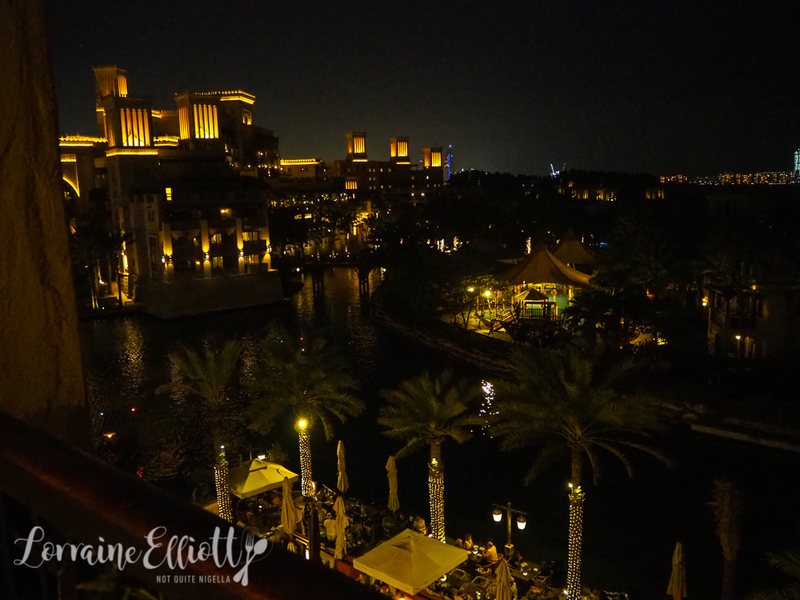 We walk through the labyrinthine faux Souk Madinat Jumeirah to get to Folly by Nick and Scott. 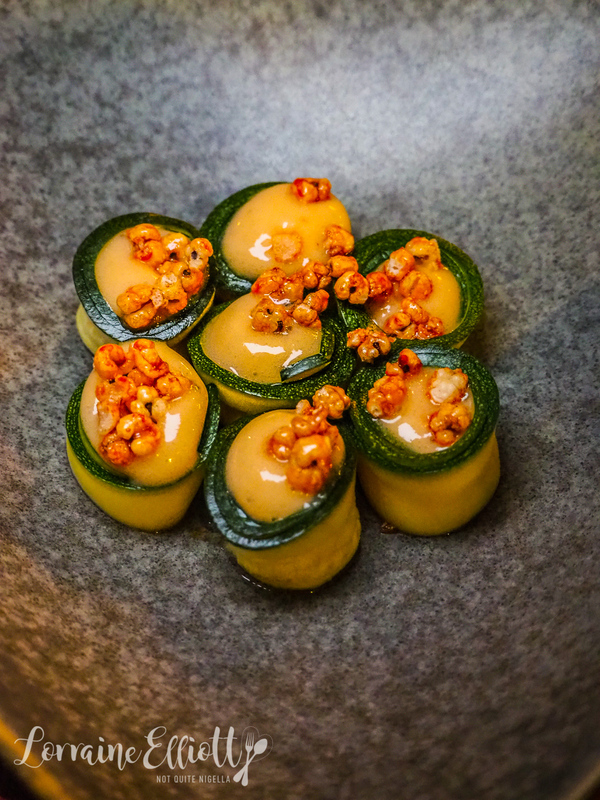 Nick Alvis and Scott Price are two British chefs who worked with Gordon Ramsay for 15 years in London, Paris and Dubai before branching out on their own. 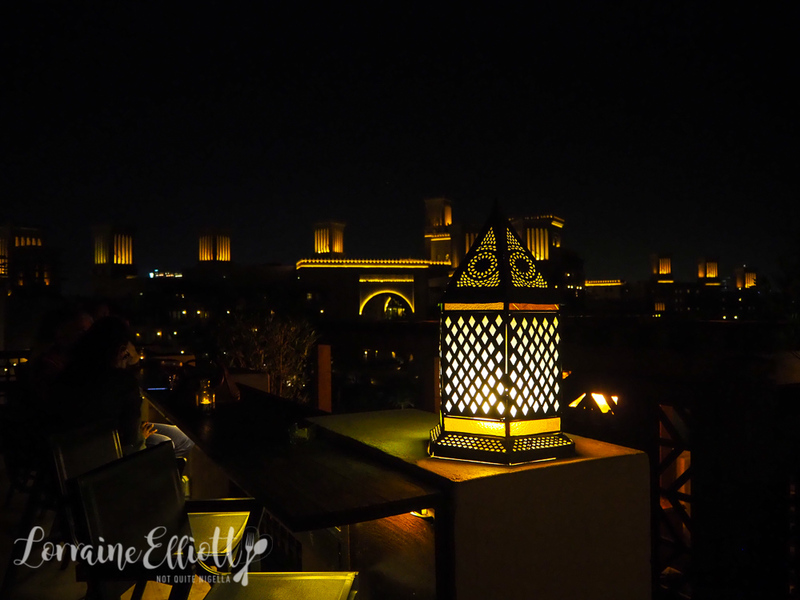 Whilst there is an indoor section, the perfect weather means that most guests are sitting outside enjoying the perfect night. 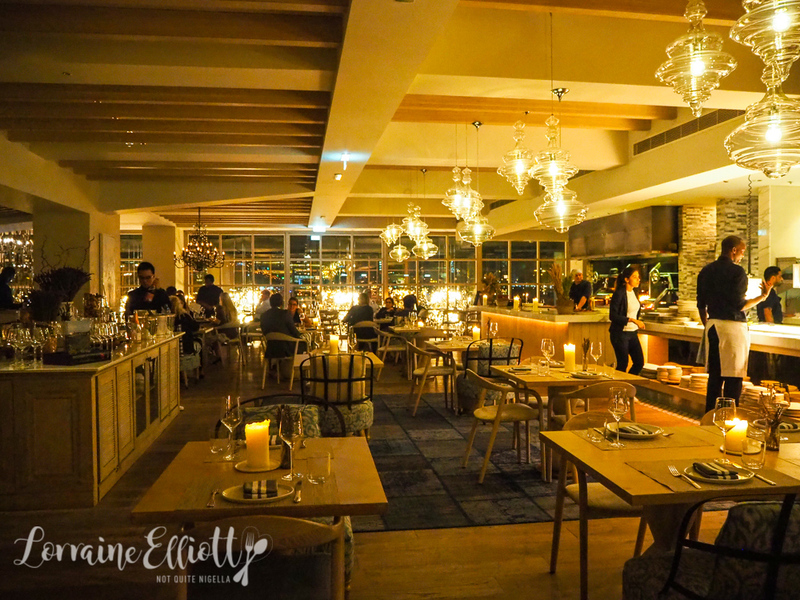 There are two floors and the upper level bar is well worth having a look at for the views of the 7 star Burj al Arab hotel and all the water activity below at the Madinat waterways. 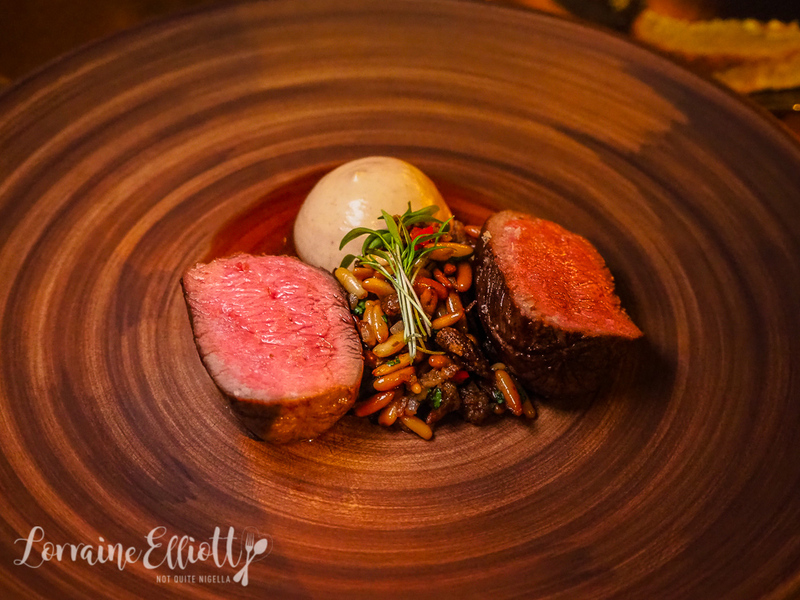 Folly have a special menu just for Dubai Food Week with three courses for 199AED which equates to around $70AUD. We start with an interesting item: jasmine rice with Marmite and courgette. It's unusual and I'm not sure if I would order it again and it comes in quite a large serve. A canape sized version would have been perfect just for a taste. 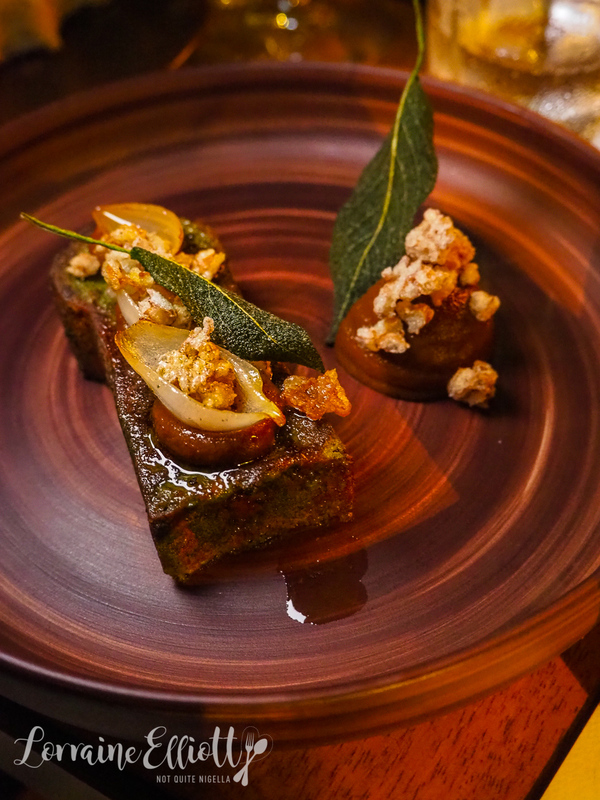 The fried bread with sage, onion and spelt and caramelised onion is divine. "It tastes like Christmas" says my sometime vegetarian friend Laura. And it does indeed. Although you'd expect fried bread to be a bit greasy it isn't in the slightest bit so. I also love the main of lamb with two perfectly cooked medallions of lamb saddle. The long pine nut salad and whipped pine nut cream are also delicious and I could just eat an entire bowl of this. For dessert we enjoy the chocolate, hazelnut and malt with the bottom layer of malt cream. 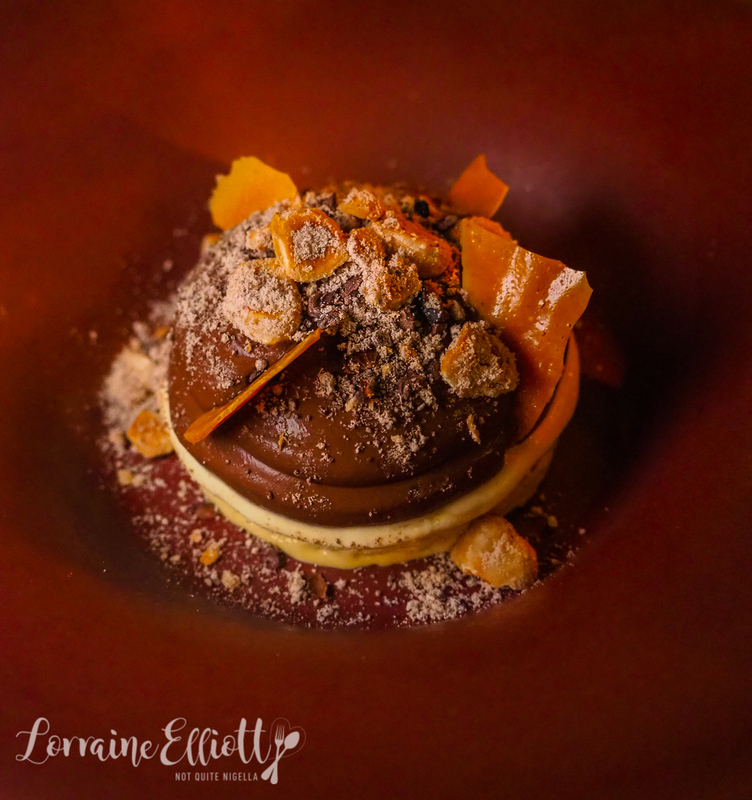 The chocolate is dark and fruity and the toasted hazelnuts give it a nice crunch. Our home for the next two nights in Dubai is the Renaissance Downtown hotel located in downtown Dubai. 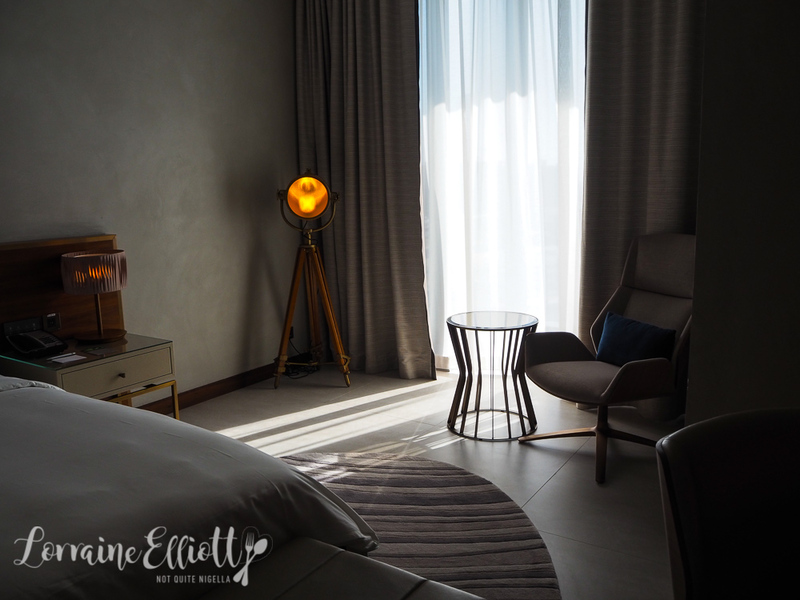 It's a stylish new hotel that opened in November 2017 and even the entry level rooms are plush, well appointed and spacious. I have a deluxe room #911. On the left when I walk in there is a spacious walk in wardrobe. 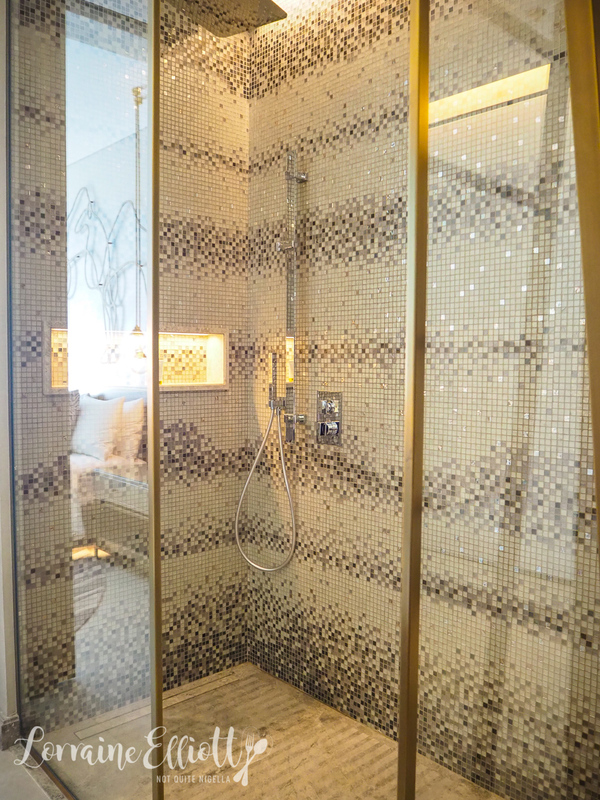 The bathroom follows this and there's a separate shower with gold flecked tiles and two shower heads. There's also a free standing egg shaped bath and double sinks with Amouage toiletries. 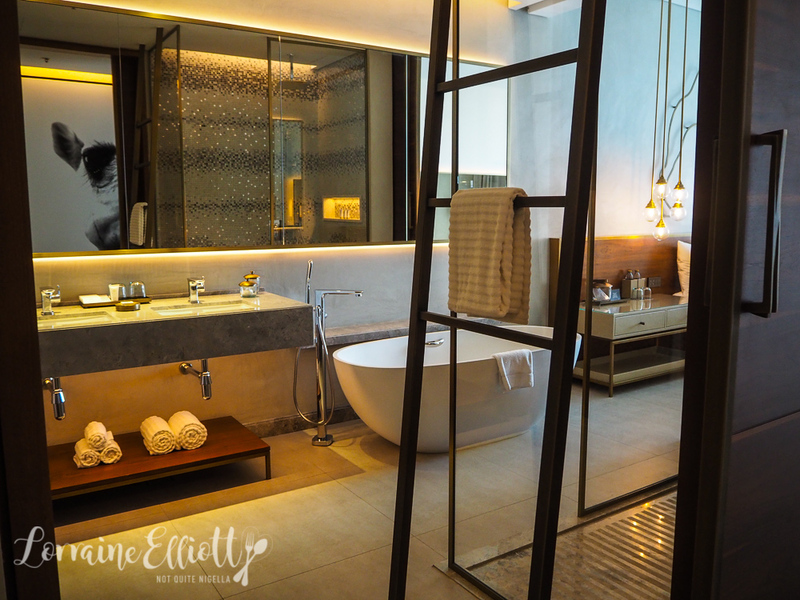 Wooden sliding doors partition off the bathroom from two sides and the toilet and bidet are in a separate room. The bedroom is also roomy with a comfortable king sized bed with excellent sheets and a good variety of pillows. 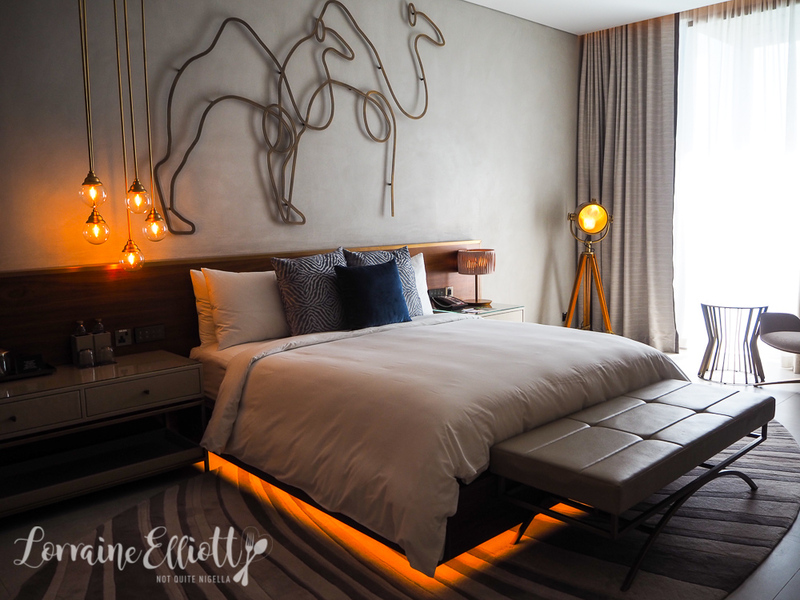 The camel motif is one carried throughout the hotel with a large wall print as well as an above the bed art work. An enormous work desk is placed below the television built into the mirror opposite the bed. 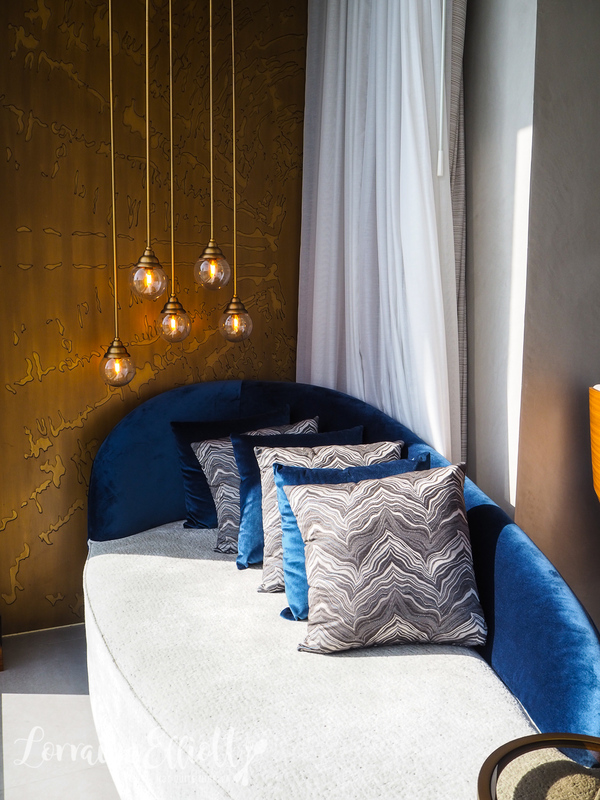 Some rooms like this one has a little alcove built into them where there's a lounge and cushions that affords you a view of the water below. The hotel also has a French restaurant Bleu Blanc with chef patron David Myers. The theme as you enter from the outside blue door is French provincial although the menu isn't particularly French and covers steak and seafood offerings. Service is serious and not overly friendly. 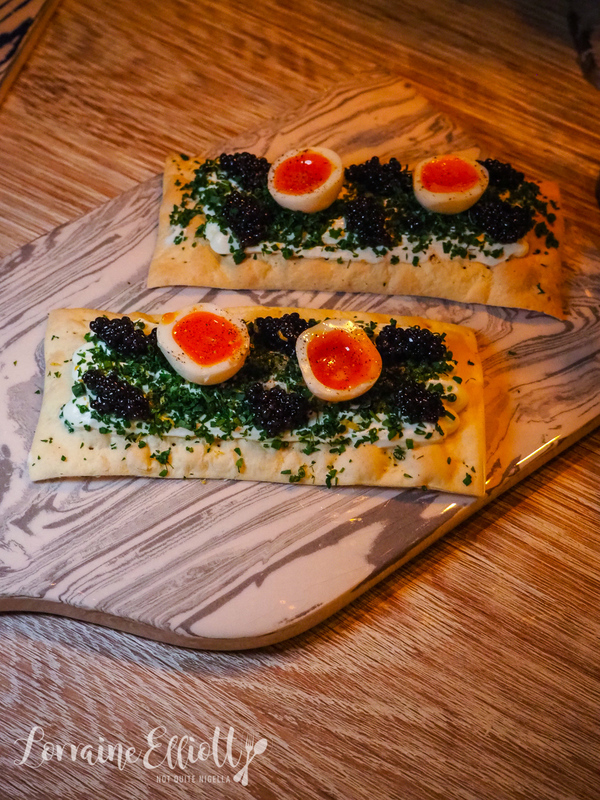 The caviar flatbread comes as two thin pieces of crisp cracker topped with Sturia caviar and creme fraiche. And because we are sharing them they give us a small sword to cut them. 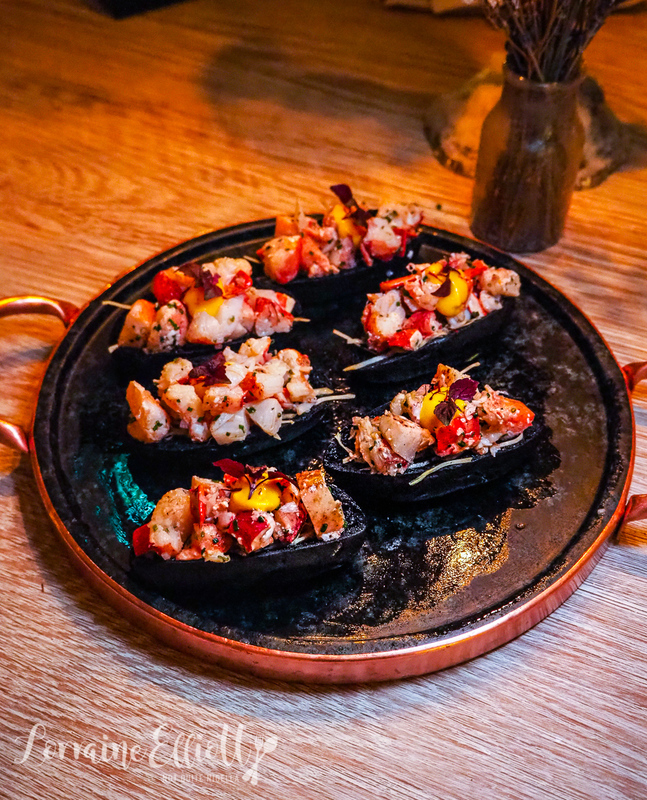 We start with charcoal lobster rolls that are small but generously filled with chunks of lobster. These rolls are for people that don't like mayonnaise in their lobster rolls as the amount of saffron aioli is small and they come two to a serve. 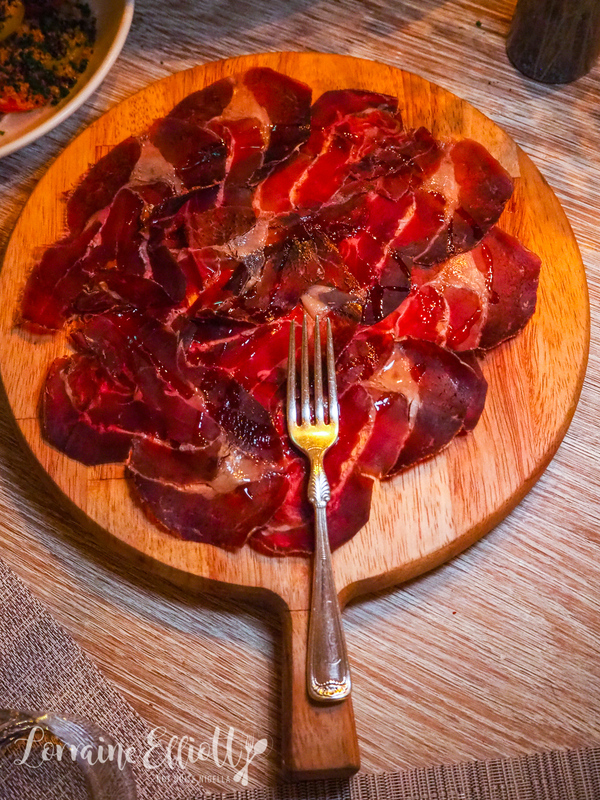 The Cecina de Leon comes in a generous portion with slices of toasted rye bread. 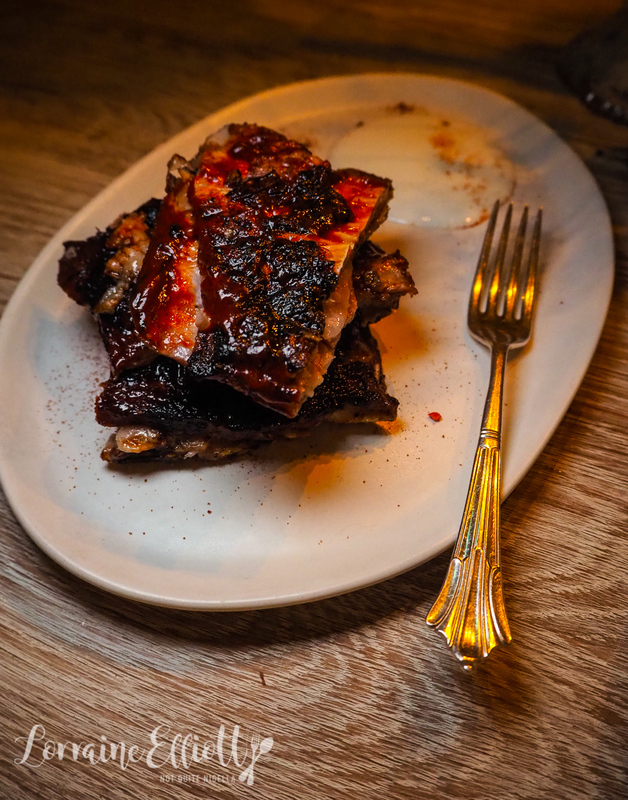 The lamb ribs are also a good sized serve for sharing and come as three racks of four ribs. They're juicy and very soft with a moreish and slightly sweet caramelised barbecue glaze with a hint of chilli spice. To the side is a dipping yogurt. 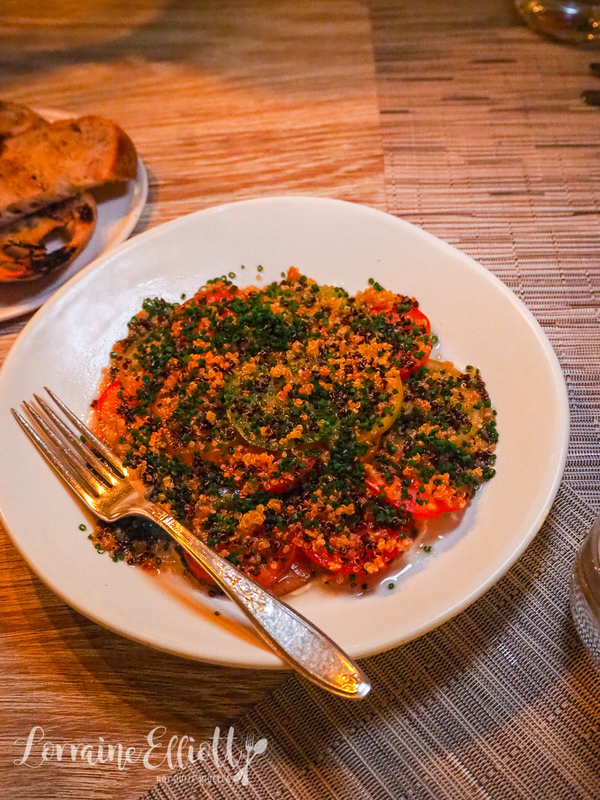 The heirloom tomato salad comes topped with crunchy quinoa to give it plenty of texture. 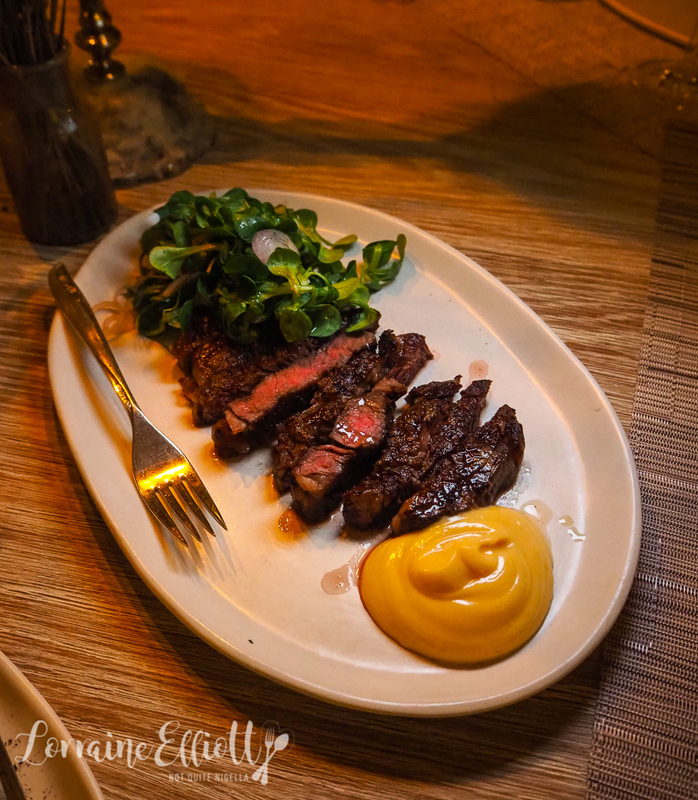 Sadly a couple of things were sold out that I wanted like the king crab beignets and the Irish Dry Aged Rib Eye but we got the boneless rib eye instead and it's very succulent and delicious-so much so that I go back for thirds of this despite claiming that I was not hungry. 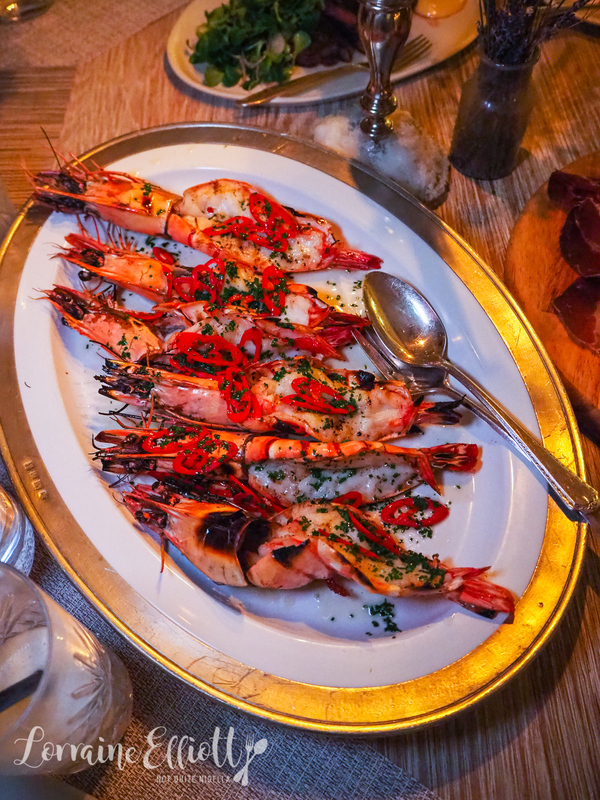 The prawns are split down the centre and grilled and served with chilli and herbs. 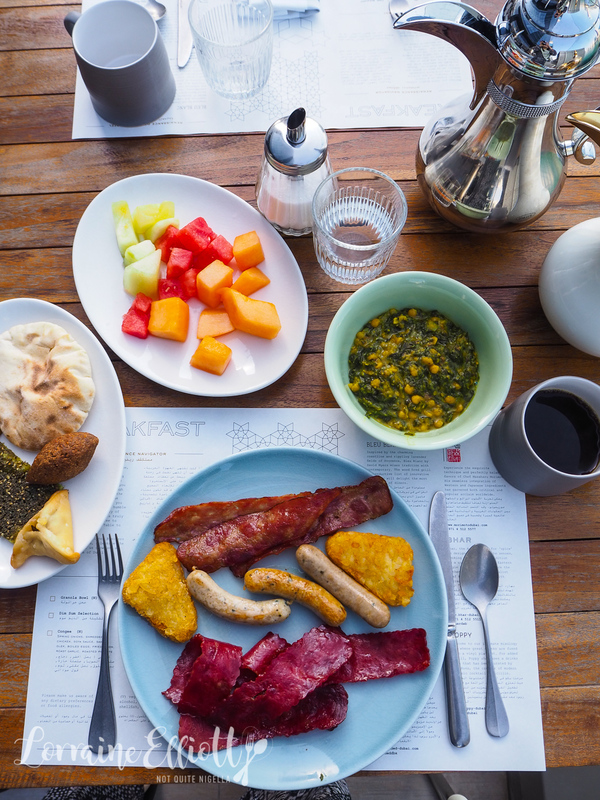 Breakfast is also an impressive affair with plenty of choice with Asian, Indian and Middle Eastern stations as well as the usual Continental selection. Because Dubai is a Muslim country you won't find pork at breakfast. Instead there is a veal and beef bacon (that tastes a bit like bakkwa) as well as chicken sausages. But my favourite bits are the Middle Eastern breads, sambousek pastries and Indian egg curries. Because while in Dubai you eat Dubai style! So tell me Dear Reader, do you always book breakfast to be included with your hotel stay? 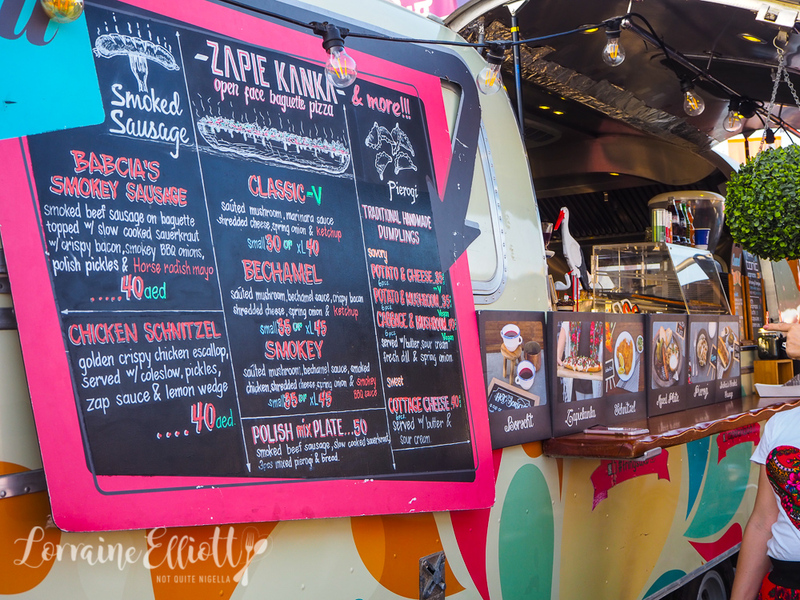 And have you ever tried a zapiekanka before? NQN travelled as a guest of Visit Dubai but all opinions remain her own.